Last week as part of our Get Fit and Healthy campaign, a number of our team embarked on a Walk to Work Week. This included a number of our cyclists. Between us we managed to walk 200 miles at an average of 11 miles per person. A great effort by all involved considering we had staff holidays and other excuses to contend with! Fortunately the weather in South Shields last week was very nice indeed and it was a pleasure to benefit from the fresh air. Now that we have targets to aim for we may try to beat this record in the summer. Our company is an active member of the South Tyneside Health Alliance Program which is endeavouring to encourage staff participation in health related issues. 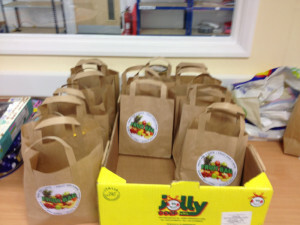 We recently also initiated the “Fruity Monday” campaign, whereby through a deal with a local greengrocer all the staff are given a bag of fruit for their enjoyment.